Presets can store common metadata, intros/outros, file format and algorithms settings, external services, etc. for a group of recordings (e.g. a podcast series). You can select your preset when creating a new Production or when using the Auphonic API. Automatically add an Intro/Outro to your production. IMPORTANT: this feature is audio-only and does not work with video productions! As intros/outros are intended to be used multiple times, they are only Loudness Normalized to match the loudness of your production without further Auphonic processing (no leveling, filtering, noise reduction, etc.). Therefore you should edit/process your intro/outro before. 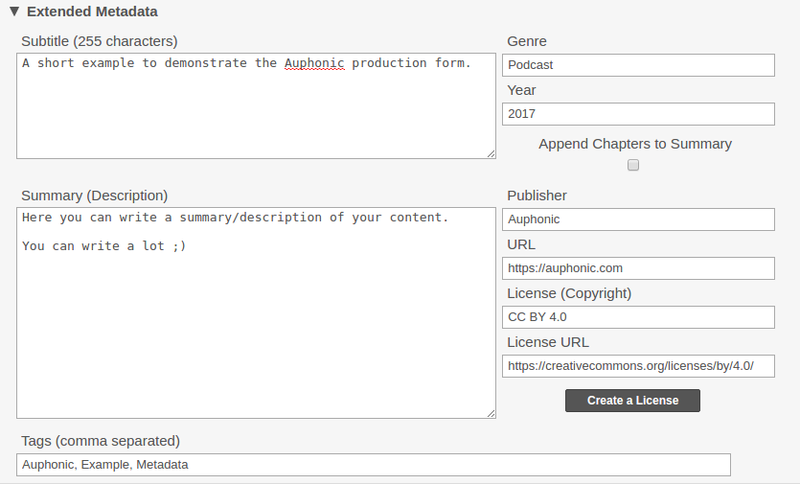 For a detailed description of our intro/outro feature, please see the blog post Automatic Intros and Outros in Auphonic. (Dropbox, SFTP, S3, Google Drive, SoundCloud, etc. - please register the service first). Set overlap time in seconds of intro end with main audio file start, for details see Overlapping Intros/Outros. IMPORTANT: ducking must be added manually to intro audio file! Set overlap time in seconds of outro start with main audio file end, for details see Overlapping Intros/Outros. IMPORTANT: ducking must be added manually to outro audio file! Basic metadata (title, cover image, artist, album, track) for your production. Metadata tags and cover images from input files will be imported automatically in empty fields! We correctly map metadata to multiple Output Files. For details see the following blog posts: ID3 Tags Metadata (used in MP3 output files), Vorbis Comment Metadata (used in FLAC, Opus and Ogg Vorbis output files) and MPEG-4 iTunes-style Metadata (used in AAC, M4A/M4B/MP4 and ALAC output files). Add a cover image or leave empty to import the cover image from your input file. If a Video Output File or YouTube export is selected, Auphonic generates a video with cover/chapter image(s) automatically! Extended metadata (subtitle, summary, genre, etc.) for your production. Metadata tags from input files will be imported automatically in empty fields! A subtitle for your production, must not be longer than 255 characters! Here you can write an extended summary or description of your content. Append possible Chapter Marks with time codes and URLs to your Summary. This might be useful for audio players which don’t support chapters! Link to create your license at creativecommons.org. Copy the license and its URL into the metadata fields License (Copyright) and License URL! Tags must be separated by comma signs! Add one or multiple output file formats (MP3, MP4, Ogg, WAV, Video, ...) with bitrate, channel and filename settings to a production (see Audio File Formats and Bitrates for Podcasts). All Metadata Fields and Chapter Markers will be mapped to multiple output files. See below for a list of other, specialized output formats. With Auphonic you can process video input files as well, or automatically generate a video output file from input audio using Cover and Chapter images - for details see Video Input and Output. Set basename (without extension) for all output files or leave it empty to take the original basename of your input file. For an overview of audio formats see Audio File Formats and Bitrates for Podcasts. Set combined bitrate of all channels of your audio output file. For details see Audio File Formats and Bitrates for Podcasts. Suffix for filename generation of the current output file, leave empty for automatic suffix! Filename extension of the current output file. Click here to force a mono mixdown of the current output file. If you have Chapter Marks, this option will split your audio in one file per chapter. All filenames will be appended with the chapter number and packed into one ZIP output file. 1. First you have to connect to an external Speech Recognition Service at the External Services page. 2. Then you can select the speech recognition engine when creating a new Production or Preset. We send small audio segments to the speech recognition engine and then combine the results, add punctuation and structuring to produce 3 Output Result Files: an HTML transcript, a WebVTT/SRT subtitle file and a JSON/XML speech data file. If you use a Multitrack Production, we can automatically assign speaker names to all transcribed audio segments. For more details about our speech recognition system, the available engines, the produced output files and for some complete examples in English and German, please see Speech Recognition. Select an external service for Automatic Speech Recognition. Please register a service first! Select a language/variant for speech recognition. Add Word and Phrase Hints to improve speech recognition accuracy for specific keywords and phrases. Metadata (chapters, tags, title, artist, album) will be added automatically! The language must be set directly in your Wit.ai App. IMPORTANT: If you need multiple languages, you have to add an additional Wit.ai service for each language! Add Custom Vocabularies to improve speech recognition accuracy for specific keywords and phrases. Select a language/variant for speech recognition with Speechmatics. 1. First you have to connect to an external service at the External Services page. 2. Then you can select the service when creating a new Production or Preset. When exporting to Podcasting/Audio/Video Services (SoundCloud, YouTube, Libsyn, Podigee, Spreaker, Blubrry, Podlove, etc. ), all metadata will be exported as well. For a complete list and details about all supported services, see Auphonic External Services. Select an external service for outgoing file transfers. Please register your service first! Select which Output File should be copied to the current external service. Unlisted (everyone who knows the URL can see it, not indexed by YouTube). Post to News Feed: The exported video is posted directly to your news feed / timeline. Exclude from News Feed: The exported video is visible in the videos tab of your Facebook Page/User (see for example Auphonic’s video tab), but it is not posted to your news feed (you can do that later if you want). Secret: Only you can see the exported video, it is not shown in the Facebook video tab and it is not posted to your news feed (you can do that later if you want). For more details and examples please see the Facebook Export blog post. Choose if the exported video should be embeddable in third-party websites. Set your exported audio to Public or Private (not visible by other users). Select if users should be able to download your audio on SoundCloud, otherwise only streaming is allowed. Select an audio output file which should be exported to SoundCloud. If set to Automatic, Auphonic will automatically choose a file. Select your Spreaker Collection where this track should be published. Each Collection has a separate RSS feed and can be created in your Spreaker Account. If disabled, listeners won’t be able to download this track and it won’t be included in your RSS feed. Enable/disable audio algorithms. For more details see Auphonic Post Production Algorithms! Please don’t change our default values if you don’t know what these parameters mean - they should be a good starting point for most content! For more control, please use our Advanced Audio Algorithm Parameters. Corrects level differences within one file between speakers, music and speech, etc. to achieve a balanced overall loudness. For more see Adaptive Leveler Details and Advanced Leveler Parameters. Adjusts the global, overall loudness to the specified Loudness Target (using a True Peak Limiter), so that all processed files have a similar average loudness. For more see Global Loudness Normalization with True Peak Limiter Detail and Advanced Loudness Normalization Parameters. Set a loudness target in LUFS for Loudness Normalization, higher values result in louder audio outputs. The maximum true peak level will set automatically to -1dBTP for loudness targets >= -23 LUFS (EBU R128) and to -2dBTP for loudness targets <= -24 LUFS (ATSC A/85). For details and examples see Global Loudness Normalization and True Peak Limiter. unnecessary/disturbing low frequencies in each audio segment. Classifies regions with different backgrounds and automatically removes noise and hum in each region. For more see Noise Reduction, Hum Reduction Details and Advanced Noise&Hum Reduction Parameters. Maximum noise and hum reduction amount in dB, higher values remove more noise. In Auto mode, a classifier decides if and how much noise reduction is necessary (to avoid artifacts). Set to a custom (non-Auto) value if you prefer more noise reduction or want to bypass our classifier, but be aware, this might result in artifacts or destroy music segments! Enable/disable advanced parameters for our Audio Algorithms. Please don’t use our advanced algorithm parameters if you don’t understand them! Use our default settings instead, they are a good starting point for most content. Advanced algorithm parameters are currently in private beta mode: Join here! 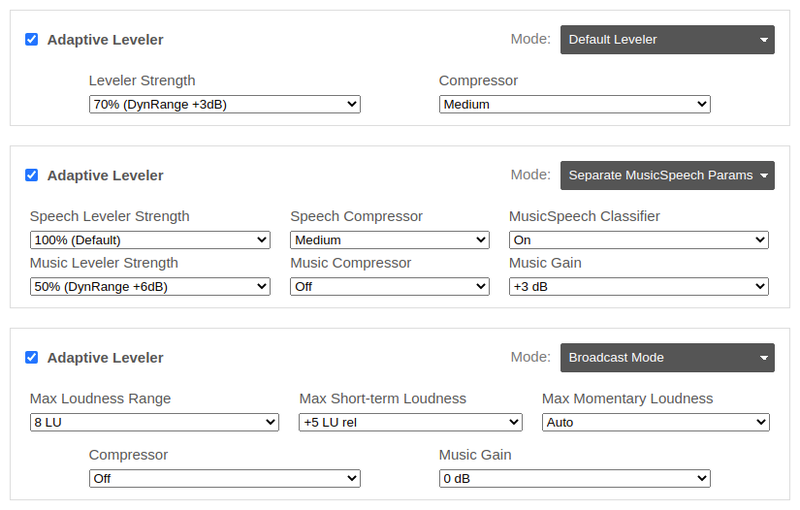 The following advanced parameters for our Adaptive Leveler allow you to customize which parts of the audio should be leveled, how much they should be leveled, and how much dynamic range compression should be applied. Select a Leveler Preset to change the Adaptive Leveler algorithm. Default Leveler: Our classic, default leveling algorithm. Use it if you are unsure. Foreground Only Leveler: This preset reacts slower and levels foreground parts only. Use it if you have background speech or background music, which should not be amplified. Fast Leveler: A preset which reacts much faster. It is built for recordings with fast and extreme loudness differences, for example, to amplify very quiet questions from the audience in a lecture recording, to balance fast-changing soft and loud voices within one audio track, etc. Amplify Everything: Amplify as much as possible. Similar to the Fast Leveler, but also amplifies non-speech background sounds like noise. Our default Leveler tries to normalize all speakers to a similar loudness so that a consumer in a car or subway doesn’t feel the need to reach for the volume control. However, in other environments (living room, cinema, etc.) or in dynamic recordings, you might want more level differences (Dynamic Range, Loudness Range / LRA) between speakers and within music segments. We also like to call this Loudness Comfort Zone: above a maximum and below a minimum possible level (the comfort zone), no leveling is applied. So if your input file already has a small dynamic range (is within the comfort zone), our leveler will be just bypassed. Higher dynamic range values should be used if you want to keep more loudness differences in dynamic narration or dynamic music recordings (live concert/classical). It is also possible to utilize this parameter to generate automatic mixdowns with different loudness range (LRA) values for different target environments (very compressed ones like mobile devices or Alexa, very dynamic ones like home cinema, etc.). Select a preset for Micro-Dynamics Compression: The compressor reduces the volume of short and loud spikes like “p”, “t” or laughter (short-term dynamics) and also shapes the sound of your voice (it will sound more/less “processed” or “punchy”). The Leveler, on the other hand, adjusts mid-term level differences, as done by a sound engineer, using the faders of an audio mixer, so that a listener doesn’t have to adjust the playback volume all the time. For more details please see Loudness Normalization and Compression of Podcasts and Speech Audio. Auto: The compressor setting depends on the selected Leveler Preset. Medium compression is used in Foreground Only and Default Leveler presets, Hard compression in our Fast Leveler and Amplify Everything presets. Hard: More compression, especially tries to compress short and extreme level overshoots. Use this preset if you want your voice to sound very processed, our if you have extreme and fast-changing level differences. Off: No short-term dynamics compression is used at all, only mid-term leveling. Switch off the compressor if you just want to adjust the loudness range without any additional micro-dynamics compression. Use the switch Separate MusicSpeech Parameters (top right), to see separate Adaptive Leveler parameters for music and speech segments, to control all leveling details separately for speech and music parts. For dialog intelligibility improvements in films and TV, it is important that the speech/dialog level and loudness range is not too soft compared to the overall programme level and loudness range. This parameter allows you to use more leveling in speech parts while keeping music and FX elements less processed. Note: Speech, music and overall loudness and loudness range of your production are also displayed in our Audio Processing Statistics! Music live recordings or dynamic music mixes, where you want to amplify all speakers (speech dynamic range should be small) but keep the dynamic range within and between music segments (music dynamic range should be high). Dialog intelligibility improvements for films and TV, without effecting music and FX elements. Select separate Leveler Presets for music and speech segments. The default music preset is Same as Speech (combined settings for music and speech segments). Select separate Dynamic Range targets for music and speech segments. 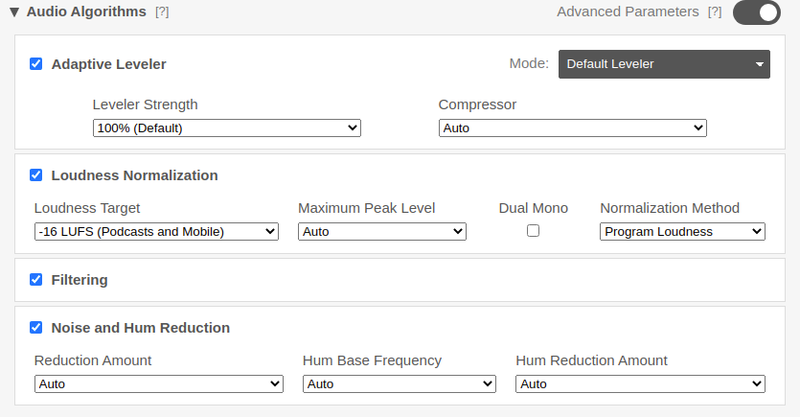 Select separate Compressor Presets for music and speech segments. Advanced parameters for our Global Loudness Normalization and True Peak Limiter algorithms. Maximum True Peak Level of the processed output file. Use Auto for a reasonable value according to the selected loudness target: -1dBTP for EBU R128 and higher, -2dBTP for ATSC A/85 and lower. In addition to the parameter (Noise) Reduction Amount, we offer two more advanced parameters to control the combination of our Noise and Hum Reduction algorithms. Maximum hum reduction in dB, higher values remove more hum. In Auto mode, a classifier decides how much hum reduction is necessary for each speech region. Set it to a custom value (> 0), if you prefer more hum reduction or want to bypass our classifier. Use Disable Dehum to disable hum reduction and use our noise reduction algorithms only.